These came with the bungalow. I don’t trim them munch. I didn’t really know what they were until a few minutes ago, when I came to the conclusion that they are rhododendron. Someone please verify. 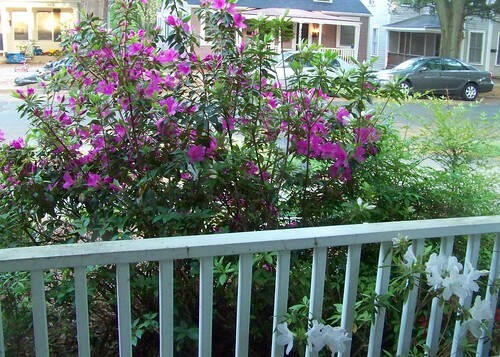 And, then, what are the white flowers that are coming through onto the porch? Taken about two weeks ago. It’s sad that they blooms will be off pretty soon, because there’s not much color in my yard over the summer, except for those spiders. Pretty. Maybe those are white rhododendron? I can’t see the leaves well. I saw the rosemary when I clicked over to all the photos… that is really pretty. The pink and the white both appear to be rhododendron. If they are not pruned occassionally they can get leggy (flowers only at the ends of the branches). Before your backyard was cleared I think that there was at least one that was tree-sized. Rhododendron usuallu have waxy leaves. 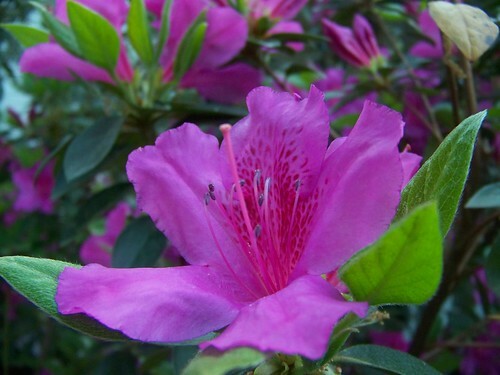 If not, they could be azaleas )usually smaller leaves). I’ve never seen a rhododendron to know what one looks like… but these are what I’ve always known as azaleas. The blooms can be pink or white, and the leaves are on the thinner, flimsier side. You’re also supposed to be able to tell the difference based on leaves and number of stamen, but the article I read says Rhododendrons have about ten stamen and azaleas have five. Your plants have narrow leaves and nine stamen?… so your guess is as good as mine. Point being: they’re essentially the same darn thing, and I’ve just been calling *all* of them azaleas my entire life. Ya learn something every day.